Irish singer-songwriter Barry Moore, the younger brother of Christy, brandname Luka Bloom, penned a series of great songs and recorded a string of successful albums in his lifetime. Thanks heaven, The Man Is Alive. Luka grew up in Newbridge in County Kildare. He lives again in the locality, in a country house just five miles from where it all started, and 25 years after he left Dublin for America. This DVD features two 45 minutes gigs, an afternoon concert in Luka's living-room in Kildare and a night event in a Dublin venue. Luka displays his two sides, the percussive straight-in-your-face guitar sound and the nylon-strung, finger-picked guitar. The music is on a CD too, and the DVD also features a Q&A with the audience and a documentary. It shows an artist at the crossroads, he's fifty now, who holds his breath and looks back. Luka has no more interest in songs that entertain and have nothing to say (actually he never had), Luka wants to say something or stay silent forever. His intentions are not to change the world, but to touch people and transform individual lives. And yes, I believe, he's capable of anything. One of the great artists of our time! I owe an awful lot in my life to Luka Bloom. Even though I've never met the man, he's been a very large part of my life for the past 15 years or so… since the first time I heard him covering LL Cool J's "I Need Love", in fact. The words and voice of the Irishman have lulled me into sleep for more than 85% of the nights over the past decade, each nuance of his recorded works indelibly etched into my heart and mind. But nothing in his recorded catalog is as transcendent as seeing him perform live, especially in a small, intimate venue. And what, I ask, could be more intimate than hearing Luka Bloom perform in his own living room? The new DVD/CD collection The Man Is Alive starts off with An Afternoon In Kildare. This set of music is intimate and inspiring, Luka performing for a very small crowd in his own living room. He begins the set with a wonderful version of "I Am Not At War With Anyone" that is truly inspiring, and a powerful reading of "No Matter Where You Go, There You Are". The small audience sings along wonderfully on the chorus of "Sunny Sailor Boy", adding the depth you can only get from the emotion of a live Luka show. While Luka plays "Lighthouse" the audience is enraptured, lost in the pure spiritual mysticism of the music. When Luka switches to the steel string and blasts into "You Couldn't Have Come At A Better Time" the crowd is energized and sings along heartily, finding a beautiful release from the introspective lull of the beginning of the set… truly showing why his shows are so inspiring and honest. The second DVD segment is called An Evening In Dublin, and finds Luka playing in front of a rather appreciative small audience in Dublin. He performs many tracks from his most recent record Innocence, including the title track (which is simply brilliant) and a stunning version of "City Of Chicago" with the audience singing along wonderfully. "Here And Now" and "Don't Be Afraid Of The Light That Shines Within You" are notes of absolute bliss in the set, transcending the man and creating the mysticism for which Bloom has become so rightfully well-known. A stunning version of "Exploring The Blue" leads beautifully into the immensely powerful "Gone To Pablo" before Luka wraps up the set with the now classic "The Man Is Alive" teamed in medley with "Hill Of Allen". 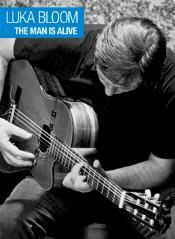 The accompanying CD titled The Man Is Alive is a nice audio companion to the DVD set, bringing together performances from both intimate shows into one beautiful set of music. While the performances are varied, the continuity is amazing, really showing the keen musical abilities possessed by Luka Bloom. No matter where you record him, the music is amazing, intimate, and powerful. There are a few scattered tracks not included on the accompanying DVDs, including a tremendously moving version of "Thank You For Bringing Me Here" and the absolutely luminous "Love Is A Place I Dream Of". This is a brilliant package, and one that will be a treasured addition to anyone's music collection. For me, it breathes new life into songs that have never grown old, and allows me to relive the treasured memories I have of seeing Luka perform live myself.